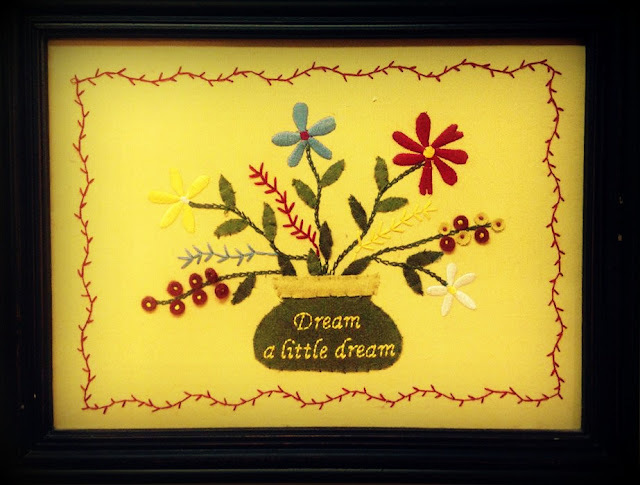 I've been lurking at Sandra's Happy Homemaker Mondays for a couple weeks now and decided this week to join in and do one of my own! You can check out the prompts at Diary of a Stay At Home Mom. Today we were surprised by a bit of snow! Nothing stuck and it only lasted for short bursts, but the kids still had fun outside for the couple of minutes it lasted! A friend was in Joplin today and said they were getting snow and since we had a lot of wind, I guess it just blew south a bit! I've just finished up a government lesson with my 16 and 14 year olds. We are going through a US History book together as part of their homeschooling lessons and really enjoyed our time together. We tend to rabbit trail in all different directions so these discussions take much longer than planned. I'm thankful I'm blessed to be able to homeschool during this time. The house is quiet and everyone is relaxing. I'm trying to decide if I want to read my book all evening or watch Merlin with Jamie. We just started re-watching the series. It may require ice cream. I'm trying to decide if I feel like going to buy some this late. I'm currently reading The Treasure Box by Penelope J. Stokes. I don't love it but it's keeping my attention. 10 years ago I would have devoured it and ordered everything I could find by her. But now, I feel like I'm wasting time if I read fiction that doesn't have a firm base in reality. This one is kind of science-fictiony so I'm not that into it---but I'm trying to lighten up. I'm not sure what they're watching out there. I imagine it's probably The Bible series on Netflix. My favorite post from last week is my Stepping Heavenward review on my book blog, Belle's Library. That was such a great book! Today my almost 7 year old, Avalon, received her first Math books in the mail. She grabbed them and squealed and ran around the house showing everyone. She immediately began working on them and only stopped for dinner time. After dinner everyone wondered where Avalon went. She was working on her Math. Today I followed a comment on one of my social media networks (or maybe it was on my book blog?) Anyway, I found Amy at Making a Joyful Home. I can't wait to see what she's got to share as my first visit to her blog was really encouraging. Six year old Liam has requested biscuits and gravy and tacos made in pita pockets. He also asked if we could have pork chops every single night forever. 11 year old Cainan is planning our Valentine's Day family party and dinner so I'm sure we'll have something special then, too. I have a large pile of sewing: 12 year old Elisha wants me to make his dress shirts cufflink-friendly. Cainan has some badges to go on his Royal Ranger vest, as does 4 year old Kynthia. I have a button to sew on pants for Elisha and Liam's super hero eye mask needs repairing. I also have a book review to put up and general housework/homeschooling. I'll do grocery shopping on Thursday. I'm considering making some curtains for my kitchen window (that's actually a fake window looking into my boys' bedroom and currently sports a Spiderman blanket for a curtain). I've got some vintage handkerchiefs that I'm going to form into some kind of pretty treatment for my side of the window. Other than ballet, we have a quiet week at home. This is always nice! Friday night I'll be visiting with a friend for awhile. That will be great! Sunday is Valentine's Day and we always do something fun for the kids here at home. This year, Cainan wants a special party so we'll need to do some crafty things ahead of time to plan for that. It's funny because there are several clutter spots in my house that usually drive me crazy but this week I just don't care! I've begun focusing on taking in extra vitamins, kefir, fermented foods, healing teas, etc. this week and I just can't believe the impact it's made on my moods. I feel so peaceful. Even though I've got homeschool clutter and craft area clutter and a pile of clothes that need to be hung up, I don't have the guilt about it that I usually have. I've focused on health and family this past week and I feel good about that. 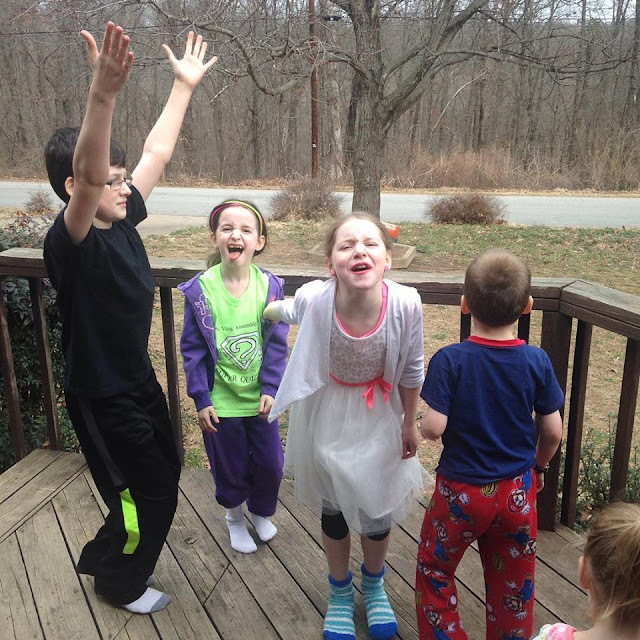 Here's a silly picture of the kids enjoying our 30 second snow! This week I'm especially praying for my friend, Sarah, who is battling Lupus and has been accepted into the Lupus treatment at Johns Hopkins in Maryland. She leaves on Sunday. None of her treatments have been effective so I'm really praying that God will use the wisdom of the doctors there to heal her and bring her relief and comfort. Please be in prayer for her, her husband, and their three young daughters. I've just finished Courageous Gentleness by Mary Froehlich and am so encouraged to practice gentleness and kindness. I'm reminded of Proverbs 31:26--"She openeth her mouth with wisdom; and in her tongue is the law of kindness." 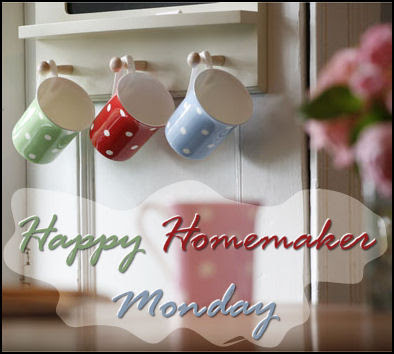 Make sure to visit Happy Homemaker Monday to see what other homemakers are sharing this week! Love the picture of your kids - even just a flake of snow is a great find for kids! Sounds like a busy but fun week - have a good one. I love hearing about your life! Stay happy, it looks good on you! What a wonderful family post. I love it as you know you and family have always been special to me. The children are growing up so fast. You do a marvelous job taking care of so much. I love how you share your life! You are such an amazing woman, mother, and wife! We had one of those 30 second snow bursts this morning. I don't mind the kind that looks pretty but doesn't make the roads slick. I think Merlin is on our Netflix list, I may have to check it out again. Hope your week is going well so far!